The ancient Ambaji temple is a major Shakti Peeth of India. It is located on the Arasur hill of the Aravalli range in Ambaji. Situated in Banaskanth District of Gujarat state, the temple is approximately 65 kms from Palanpur, 45 kms from Mount Abu, 185 kms from Ahmedabad and 50 kms from Kadiyadra near the Gujarat and Rajasthan border. Dedicated to Mother Goddess, millions of devotees visiting the Ambaji temple every year specially on Purnima days. The temple is considered one among the 51 Shaktipeeths and it is believed that the heart of the Goddess fell at this place. Locals also believe that the tonsorial ceremony of Lord Krishna took place at this site. Another popular belief of the site is that the Goddess herself, helped in the marriage of Rukmini and Krishna. It is believed that Maharaj Shivaji had came here to offer prayers to Ma Ambaji after winning a war. Ambaji temple has no image or statue of goddess. The holy Shree Visa Yantra is worshiped as the main deity and no one can see the Yantra with naked eye. The photography of the Yantra is prohibited. 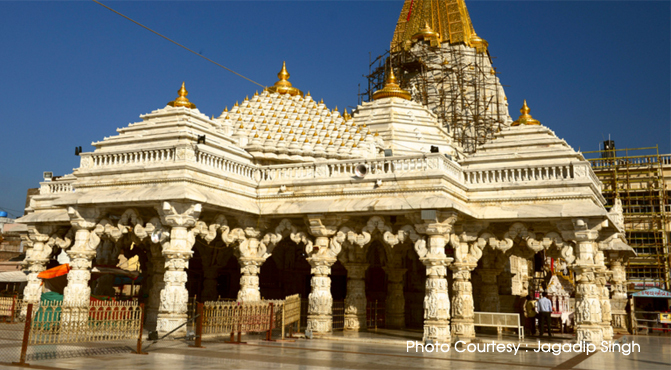 The Ambaji Temple displays finest architecture in its structural design. The temple has a twenty-one feet of dome which is coated with gold. On Dusshera, a rathyatra is held here with beautifully decorated four raths (chariots) that is run by the people and the idol of Ma Ambaji is kept on a silver rath. Ma Ambaji's ratha yatra which is run by the people is conducted on every dussehra and it provides a beautiful sight. The whole Ambaji is lighted up as the whole nation lights up at the festive time of Diwali. The Rath Yatra is marked by a procession of 4 decorated chariots adorned with flowers and garlands and the goddess idol is placed on the chariot which is fully decorated with silver colour. The occasions like Navratra, Navchandi yagna, Sahastra chandi yagna, Annakut, Shreebhog, diya darshan (deep darshan), Chosath khand are also celebrated with much pomp. Besides, the tourists can also visit the Gabbar Hill from the Ambaji Temple using the ropeway. Bhuvaneshwari Mataji Temple with Lord Ganesh as the main deity, Narbhadra hanumanji Temple, Ashapurimataji Temple, Mahalaxmi mataji temple and Mahakali mataji temple are some of the nearby temples.